Master the world with the Fame and Fortune expansion for Sid Meierâ€™s Civilization: The Board Game! 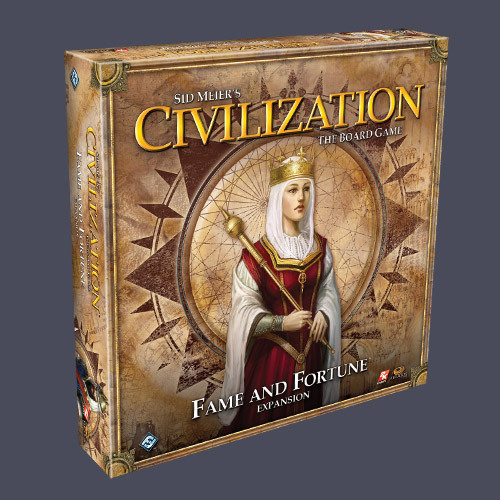 With exciting new game options, new map tiles, and components for a fifth player, Fame and Fortune will bring your civilization to remarkable new heights. Other products in the "Civilization" series. One of the most interesting choices you make in the Civ computer game is which nation to play - and with this expansion, that element now also plays a much greater part in the board game. The 4 new civilizations provide plenty of new choice and freshness to make this a great expansion. For a game that probably didn't require any more depth, this expansion does a good job of giving you more of the same good stuff without mucking up the basics of the original game. Along with the ability to add a 5th player (who would do that?!?! ), the additional techs and civilizations and cards bring enough materials to justify the cost. If you like the base game, and get to play it enough to want more options, this is a must-get.